The mission : waging war and keeping peace with America's military · One Book. One Author. One Hour. Notes on front and back endpapers explain how this story, which is based on hundreds of interviews, came to be told. They highlight the author's travel to Afghanistan with General Anthony Zinni, the role of the UN police in Kosovo, peace keeping in Bosnia, Special Forces assignments, and A-Teams. It is noted that there is a huge imbalance between money available for weapons rather than for diplomatic purposes. Other notes characterize the Army as unable to move quickly, resistant to change, obsessed with casualties, and having a post-war identity crisis; the military in the 90's is referred to as risk-averse. It is explained that A-Teams consist of a captain and 10 to 12 men and are active in 63 countries; the Special Forces Group includes 1,380 men; the main missions of the Green Berets consist of special recon, direct actions, dignity battalions, unconventional warfare, counter terrorism, foreign internal defense; the Special Operations Force is made up of 46,000. The War in Kosovo is identified as the first time alliance war since WWII - it lasted 78 days and was fought without ground forces and included a cruise missile attack on Belgrade. -- Annotations by Brian Lamb in the margins and underlining of pertinent phrases throughout the book. -- Examples: p. 14: "The military simply filled a vacuum left by an indecisive White House, an atrophied State Department, and a distracted Congress." -- p. 40: "Taking the lead had become the mission." - p. 199: "Critics in the United States, including many in Congress, believe the American military prolonged and intensified the violence in El Salvador, which claimed 75,000 lives." - p. 256: "The military's apprehension about Bosnia amounted to a kind of agoraphobia: only if the troops were kept isolated behind barbed wire would the military agree to a peacekeeping mission." 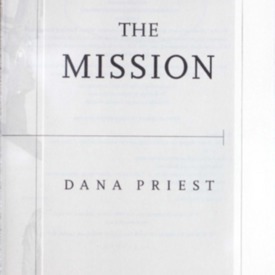 Priest, Dana, “The mission : waging war and keeping peace with America's military,” One Book. One Author. One Hour., accessed April 24, 2019, http://booknotes.gmu.edu/items/show/595. An account of America's growing dependence on its military to manage world affairs describes the cultural clashes experienced by the nation's generals, soldiers, and Green Berets in eighteen different countries.